Cardiac Catheterization Anthony Brandimarto D.O. Ronald Emmi D.O. Jeffrey Fierstein M.D. Peter Frechie D.O. Willian Haaz M.D. Steven Hess M.D. C.V. Kishan M.D. Roger Marinchak M.D. Steve Mattleman M.D. Alec Musten M.D. Scott Pfeffer D.O. Joseph Richerts M.D. Andrew Rose M.D. Alexander Rubin M.D. Robert Schlesinger M.D. Scott Spielman M.D. David Waldstein M.D. Roger Wint M. D.
After an initial consultation with your cardiologist, cardiac catheterization may be recommended. Information from cardiac catheterization may be helpful in diagnosing a variety of illnesses including valvular heart disease, coronary artery disease, congestive heart failure, and congenital heart disease. During the procedure, a small incision is made in the skin overlying the blood vessels of either the arm or the leg (incision too small for a stitch). The only potential area of discomfort is at the entry point. With adequate local anesthesia, you should be quite comfortable. Long plastic tubes called catheters are passed to the heart where pressure measurements are made. Contrast (x-ray dye) is injected through the tubes and x-ray movies are taken. From the movies, a clear picture of the coronary arteries, pumping chambers of the heart (ventricles), and valve function is achieved. In the case of coronary artery disease, blocked coronary arteries may be opened (angioplasty) during the same procedure. Following the procedure, the catheters are removed and you will be asked to lie flat for a period of time. Your doctor will review the films, discuss them with your family physician, and review the results with you and your family. 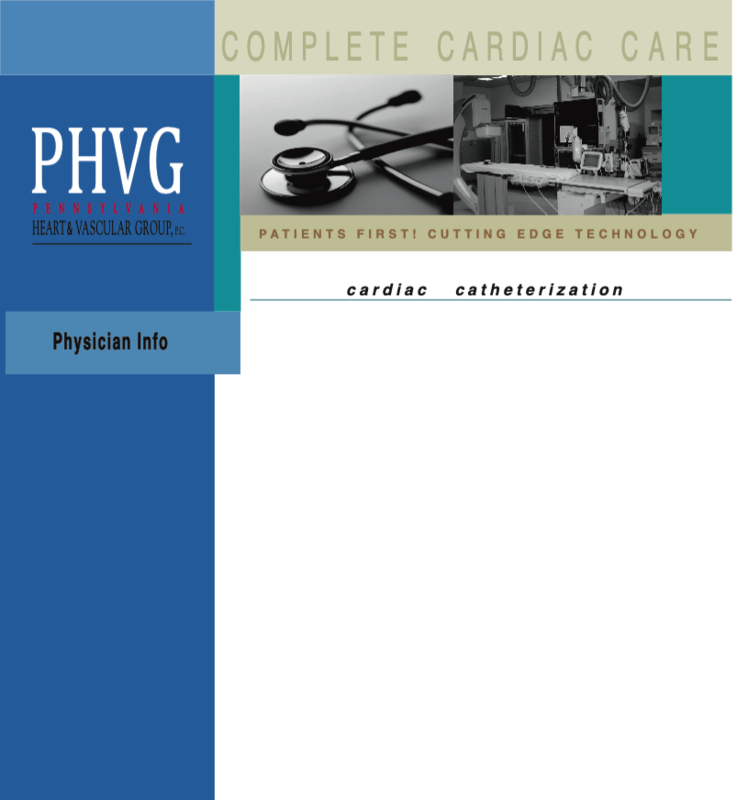 Click here for a sample cardiac catheterization.